We recommend using Medium Density Fiberboard because the density of the board will keep vibrations at a minimum. Plan ahead to ensure the box will fit in your vehicle. Once you establish how much space is available in your vehicle, calculate the box volume required for playing your subwoofer at its maximum performance level. The box volume depends on the subwoofer size. Check the table below for recommended box volumes or contact the subwoofer manufacturer for more specific recommendations. 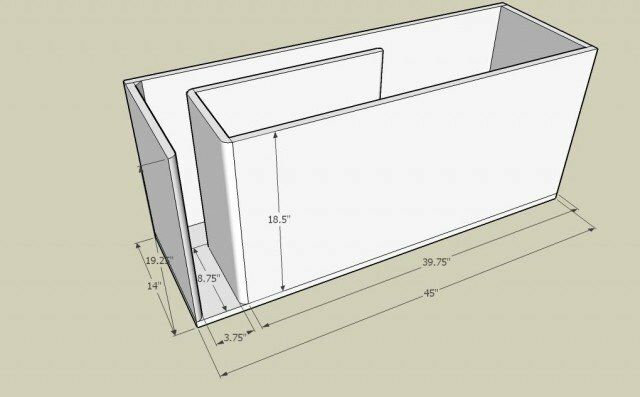 After measuring your desired box dimensions, use your pencil to draw cutout guide lines. You should use your compass to draw the exact speaker hole and the measuring tape to determine the panel size. To make the box frame, cut the Medium Density Fiberboard with a table saw. Next cut out the speaker hole with a jigsaw. Clean up any roughness from the cuts and blow out the edges with an air compressor. Now that the main panels are cut, make sure the panels match up together by temporarily assembling the box frame. Apply glue to the joint lines to set up the frame. It takes at least an hour for the glue to dry. After it dries you can start adding screws. Take a power drill to pre-drill your screw holes, and drill in screws to connect the panels. You should have one screw for every 6 inches along the joint line. Scrape off the dried wood glue with the putty knives. Use glue to seal up the inside of the box to ensure an airtight enclosure. Attach the baffle board last. The baffle board is the panel that is fashioned with the speaker hole. While the box is still open, you can use a caulking gun loaded with silicone sealant to make a seal along each joint line. Once you finish caulking the joints, you can now attach the baffle board. It is imperative that you seal off the enclosure so that it is airtight. If it is not completely airtight, it will result in less power handling for your subwoofer as well as speaker distortion. Now that your box frame is constructed, take the putty knife and apply putty along along the seams and the screw holes. Let the putty dry, and use a palm sander to first sand over the screw holes and then the flat spots. A sanding block with some sand paper will also do the trick, just use sandpaper with a 120-220 grip. You can line your box with carpet and felt in order to match your vehicle’s interior. Spray an adhesive to attach the carpet to the box and use a razor to cut away edges and the speaker hole. Use an adhesive to add some poly-fil inside the box to maximize subwoofer performance. Now place the subwoofer in the box and mount the subwoofer box and you’re ready to rock.